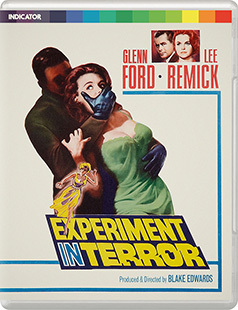 Lee Remick is a single woman terrorised by an unknown assailant and Glenn Ford is the FBI man she calls on for help in EXPERIMENT IN TERROR, Blake Edwards' terrific 1962 blend of police procedural and neo-noir thriller. 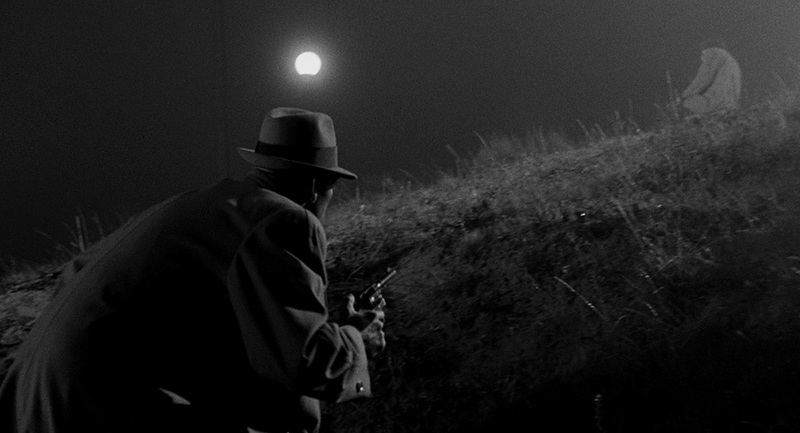 Slarek salutes the film and the Blu-ray in Indicator's typcially fine dual format release. What's the first thing that pops into your head when you think of director Blake Edwards? If you're like me, then it's probably the run of Pink Panther movies he made with Peter Sellers in the 60s and 70s, or perhaps even his still beloved Audrey Hepburn vehicle, Breakfast at Tiffany's. He's not someone I tend to associate with police procedurals or psychological thrillers, yet just 6 months after the release of the Hepburn hit, he made a film that successfully melded both of these genres. I'd never seen it before the Indicator review disc landed on my doormat, but once I started watching, it would have taken an explosion or the house catching fire to pull me away, and even then I'd probably have tried to pull the TV and Blu-ray player out through the door with me as I left. It kicks off in gripping fashion, as young Kelly Sherwood (Lee Remick) arrives home one evening and has only just stepped out of her car into her garage when a man slides out of the darkness and clasps his hand over her mouth. It turns out that he's not here to physically abuse her, but to convince her to rob $100,000 from the bank at which she is a teller. He seems to know a disturbing amount about her and makes it clear that should she fail to comply with his demands, then she and her 16-year-old sister Toby (Stefanie Powers) will come to serious harm. He's already killed twice, he assures her, and has absolutely no compunction about doing it again. He then sets her free and disappears into the night. At no time to we or Kelly get a clear look at his face. The sequence lasts a nail-biting seven minutes and is shot almost entirely in claustrophobic close-up on Kelly's terrified face. 'Do we have your attention?' the film seems to say as the assailant departs. Yeah, I'd say so. Against all expectations, the first thing that Kelly does is phone to the FBI. She's put through to agent John Ripley (Glenn Ford), but has only just begun outlining what has happened when she's knocked unconscious by her assailant. That's your last warning, he assures her when she comes to, emphasising his words by pressing the sole of his shoe onto her neck. Now she gets the message. Ripley, however, is already on the case and with only a surname name to go on, he and his partner set about tracking Kelly down. They do so with surprising speed, and when Kelly answers their call she doesn't offer the expected, fear-provoked denial that it was she who phoned before, but instead is cautious with her words and converses with Ripley under the pretence that she is chatting casually to a work colleague, aware that her assailant may be listening to every word. The savvy Ripley immediately catches on, and in the course of the coded conversation that follows, arranges to meet her at her place of work the next day. When she arrives at the bank the following morning, Kelly is discretely asked by her manager to make her way to the conference room, where Ripley is waiting. Kelly tells him what she can, making specific note of her assailant's voice and asthmatic breathing, while Ripley does his best to prepare her for how tough things may get in the near future. He seems fairly sure that the assailant is unaware that he has contacted her, but reassures her that she will be well protected either way. With no description of his face or clue to his identity, however, they are forced to wait until the assailant makes his next move. As a long-standing fan of police procedurals, I quickly warmed to Ripley's calm and pragmatic professionalism, as he makes logical moves to locate Jean seemingly seconds after their call is interrupted, and instantly cottons on to Kelly's fear that her assailant may be listening when she answers his call and shapes his questions carefully to avoid tipping him off. Over the course of the film we may learn little about Ripley as a person, aside from the fact that he's never shot anyone in the line of duty (not yet, at least), but it seems clear almost from the moment we first meet him that he's been doing this job for a good many years and that he's pretty damned good at it. Every bit as impressive is Kelly's level-headed resilience – she may be fearful for her and Toby's safety, but is quickly convinced of the logic of involving and cooperating with the FBI, and doesn't waver in her convictions when the going gets tough; in her first face-to-face meeting with Ripley, the detective warns her that her attacker "may institute a reign of terror that will make you agree to do almost anything," to which she steadfastly responds, "You mean he'll try." While a consummate professional in all other respects, you could argue that Ripley drops the ball a little when he fails to pick up on the clues being dropped by the apprehensive but quietly flirtatious Nancy Ashton, who pays him a visit to seek advice for a ‘friend' who is being pressured by someone we just know has to be Kelly's attacker. This was certainly my first response, but re-watching the film it seems more likely that we're only able to make the connection so quickly because we're being subtly steered to do so – In a film this tightly structured it seems unlikely that this scene would be here at all were it not somehow connected to the central narrative. 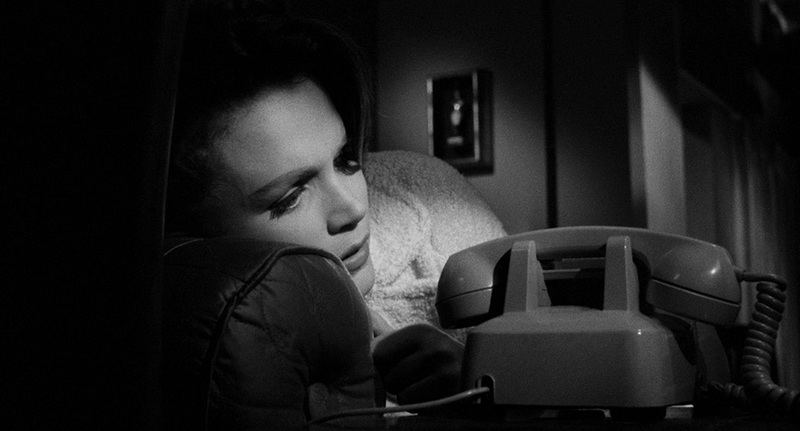 When Nancy later re-joins the story, she does so in one of the film's most visually unsettling and ultimately disturbing scenes, the unusual nature of her profession providing the visual trappings for a sequence whose surrealistic overtones transform her apartment into the setting for a waking nightmare. Whilst the identity of the assailant is initially kept concealed from the audience and his victim alike, his appearance is gradually revealed to us in a series of teasingly handled steps, ahead of his eventual identification by the FBI. Thus, by the time he orders Kelly to meet him in a crowded bar, we've seen just enough of his face to know that the man who approaches Kelly and whom she nervously agrees to leave with is not our boy, adding a new potential threat and the risk of exposing the FBI's involvement when Kelly realises her mistake and the Feds publically swoop in and arrest the wrong man. A tense sequence in itself, it does nonetheless rely on Kelly not realising that this pick-up artist is not the man who grabbed her in her garage, and while she's never seen his face she made a point of telling Ripley at their first meeting that she'd definitely recognise his voice, and his voice this ain't. Then shortly after the Feds have a name and a face and a possible lead to his whereabouts and we have him pegged as a sadistic psychopath, the film throws a curve ball in the shape of oriental single mother Lisa Soong (Anita Loo), to whom the assailant has apparently shown nothing but kindness and whose disabled young son's expensive medical bills he has paid for in full. For her, all of Ripley's grave talk about murder and protecting the life of future victims means little, and in a move that is typical of the film's refusal to play to convention, when you expect her to finally crumble and give the man up, she instead remains resolutely loyal to him. Experiment in Terror has the feel of a top-flight B-movie with A-movie production values, and I mean that in the most complimentary way. A masterclass in economical, neo-noir storytelling and tension building, it completely dispenses with the traditional build-up and instead aligns us with Kelly in the opening scene through the claustrophobic close-ups of her terrified face. It's one of many times that director Edwards flexes his creative muscles without directly drawing attention to his technique, from his penchant for framing his characters behind, in front of or through objects that seem to pass subtextual comment on their situation, to an unexpected cut to a high-angle wide-shot that perfectly captures the despairing Kelly's sense of isolation and frightened vulnerability. He's aided by consistently excellent performances from his three lead players. As Kelly, Remick completely convinces both in her opening sequence terror and her later anxious determination, though is at her low-key best when putting on a front for others and attempting to keep her underlying fear in check. Although consistently business-like and largely stripped of emotion, meanwhile, Glenn Ford completely sells Ripley as the sort of reliable and determined professional that Kelly would instinctively trust and want fighting her corner. Best of all is Ross Martin as Kelly's assailant, able as he is to deliver skin-crawlingly sinister threats without a hint of melodrama – the sequence in which he directly confronts Kelly in a restaurant bathroom dressed as an old woman sidesteps any hint of camp and proves to be one of the film's most chillingly disturbing scenes. On the technical as well as artistic front, Edwards' ace-in-the-hole here is cinematographer Philip Lathrop, whose gorgeous monochrome noir lighting camerawork gives even daylight scenes and unsettling air and infuses every night sequence with a palpable sense of threat, bathing the screen in light-punctuated darkness where danger seems to lurk in every inky-black shadow. Matching this mood is Henry Mancini's sometimes darkly sinister score, infusing sequences with a similar sense of dread and bearing some striking similarities to some of Angelo Badalamenti's work for David Lynch – how appropriate, then, that the district of San Francisco in which Kelly resides is Twin Peaks. Experiment in Terror is an object lesson in low-key, waste-free thriller construction whose surprises come less from startling plot twists than the film's refusal to play to character and story convention. The result is compelling, tense and immensely satisfying, and is genuinely worth watching for the performances, Philip Lathrop's cinematography and Blake Edwards' bold and inventive direction alone. Which just leaves the question of the true meaning of that title, and while it subtly suggests that the prime reason for theft of the money was not the prime motivation for the assailant's threat-fuelled manipulation of Kelly, it could also serve as a mission statement for this very film. Works for me. 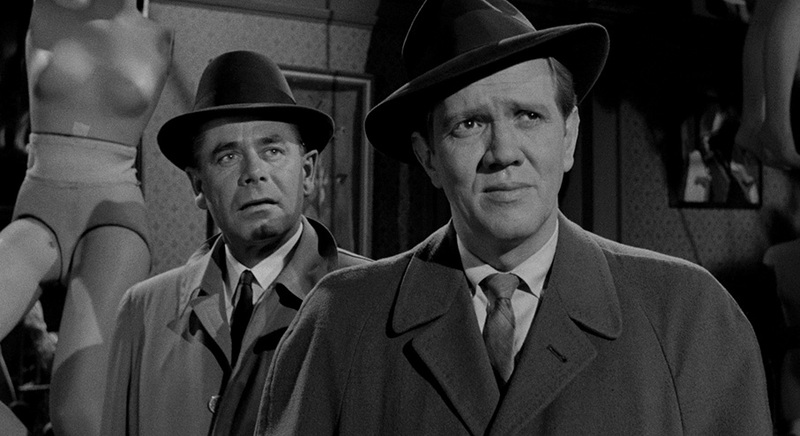 One thing you do tend to expect of noir thrillers is that the blacks be really black, and that's certainly the case on the handsome 1080p 1.85:1 HD transfer on the Blu-ray in Indicator's dual format release. Even outside in the daylight the contrast is beefy, but get inside and lower the light levels and the shadows are dark enough to keep secrets concealed and identities hidden, though the shadow detail is always there when it should be. 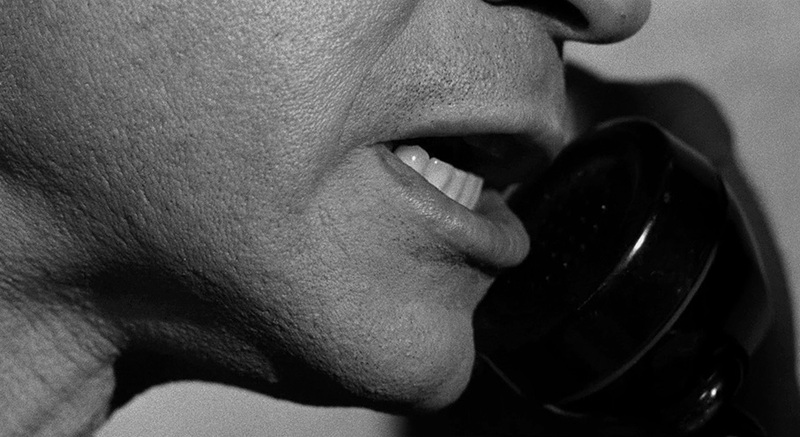 The sharpness and level of detail is consistently impressive, never more so than in the close-ups of the assailant's face when he is taunting Kelly by phone, where every pockmark on his face is clearly defined. Dust, dirt and other traces of any former damage have been banished. A most impressive transfer. You can choose between a Linear PCM 1.0 mono track or a DTS-HD 5.1 surround remix. Both are robust, with clear rendition of the dialogue and a strong presentation of Henry Mancini's score. As ever, the key differences between the surround remix and the mono original are to do with breadth and a slightly beefier bass. As with a number of Indicator, Arrow and Eureka releases, there is also an isolated score track, and this time around I actually appreciated it, able as I was to listen to Mancini's music in its clean state and better appreciate the aforementioned Badalamenti connection. Optional subtitles for the deaf and hearing impaired are also available. Writer and reviewer Kim Morgan clearly adores just about every aspect of this film and is not shy about letting us know it, notably in how many times she says, "That's a beautiful shot" and similar (she's right every time, of course). She does frequently describe what we're seeing, but this almost always evolves into a thoughtful deconstruction of the sequence in question, from its technique to her sometimes intriguing reading of its possible layers of subtext. I certainly found myself in agreement with Morgan on a good many of her observations, from her praising of Ross Martin as the film's real star to the Badalamenti-like strains of Mancini's score, and smiled at her suggestion that the film "did for garages what Psycho did for showers." There's plenty of detail on the actors and the filmmakers, but Morgan has also seen the interview with Stephanie Powers that's been included on this disc and quotes extensively from it, so I'd definitely watch that before listening to this if you want hear the stories first-hand and in more detail. 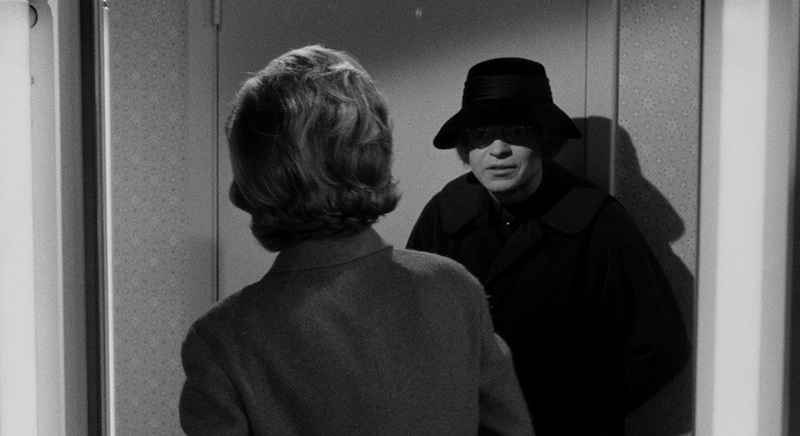 Actress Stefanie Powers opens this interview by wondering if she's the only one of the Experiment of Terror cast who's still alive, then tells a detailed story of how she landed the role of Toby, which was in part due to a chance meeting with Blake Edwards and the fact that they were wearing the same sunglasses. Trust me, it all makes sense when you hear it. She talks about working and becoming friends with Lee Remick, prepping for her scenes with an "adorable" Ross Martin, and Glenn Ford's lack of rapport with Edwards. She tells an amusing story about how Blake Edwards hit back at a shouty studio honcho with the too-good-to-be-true name of Jack Fear (actually Fier, but come on...), and even claims that there was something "David Lynchy" about the way Blake Edwards filmed. That link keeps coming up. There are also two Trailers and two TV Spots. Trailer #1 (2:23) is primarily focussed on Kelly and is saddled with uninspiring editing and a deadpan narration. Trailer #2 (2:49) kicks off with the opening two-and-a-half minutes of the film, minus the title credits, and freezes just after Kelly is grabbed and threatened, when a voice-over pronounces, "This is how one of the year's top suspense pictures begins. We urge you to see how it ends." Oh, that's so neat. TV Spot #1 (1:02) is essentially a cut down version of Trailer #1, and TV Spot #2 whittles it down even further. Not on the disc but included in the package is the always welcome Indicator Booklet, whose content is divided into two unequal but substantial halves. The first is a detailed essay on the film and its director by Kim Morgan, who echoes here some of the points she makes in her commentary whilst usefully expanding on others. The second, by Jeff Billington, is a fascinating examination of the conflict that developed between screenwriters Gordon and Mildred Gordon (that's not a repeated word typo – the male half of this married duo's name really was Gordon Gordon) and the FBI, from whom Gordon also worked as a special agent. Credits for the film, production photos and a reproduction of the poster have also been included. I was really caught out by Experiment in Terror, and less than 30 minutes in was wondering how and why I'd never got around to seeing it before. Simultaneously unhurried and tightly constructed, it's a gorgeously shot, inventively directed and compellingly performed neo-noir treat, and it looks great on Indicator's dual format release. Highly recommended.